Danja Mowf is a graduate of Norfolk State University with a degree in Electronic Engineering. He is a member of Omega Psi Phi Fraternity. He is a co-founder of the nationally recognized hip-hop crew The SupaFriendz. 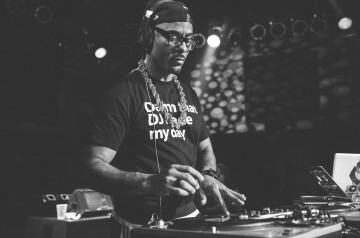 In 1996 he first produced first “Vowel Movements,” a classic hip-hop 12″ single that put the Supa crew on the map gaining international recognition in the underground/commercial rap arenas. His 1997 debut solo release “Word of Mowf” received critical acclaim for it’s introspective and artistic depth. In 1999, Danja received national exposure again while appearing alongside Aaliyah on the remix of her hit “Are You That Somebody.” Because of that performance, he would later receive an RIAA certified Platinum Plaque for contributing to sales of over 2 million, and a recording contract from superstar R&B producer and artist Missy “Misdemeanor” Elliott on her Goldmind/Elektra imprint. Since then he served as the artistic and business visionary of his indie label Danja Zone Entertainment, producing hot singles and full LP releases such as the successful SupaFriendz Vol.1 (804 Compilation) & SupaFriendz Vol 2: “SupaVision” which features the talented roster of Mad Skillz, Lonnie B. and Jo Doja. Danja would also go on to produce and appear on three songs on the Martin Lawrence, Danny Devito film soundtrack for “What’s the Worse That Could Happen.” His songs and voice can be heard during several scenes throughout the movie. Recently Danja received national recognition again for his production efforts with a VA local songstress named TYRA. After hearing her song on Dj Lonnie B’s Straight from the Streets radio show, he went on to produce several songs for her. Most notably became the hit Country Boy which rose to ..35 on the Billboard charts and ..5 on BET’s 106 & Park. His production became in great demand so he then formed the production company Country Boy Music, collaborating the efforts of several prominent producers under one fold. The result is nothing short of amazing! Now Danja runs a media company (www.MaplesMediaGroup.com) servicing creative radio, television, film, web and and print advertising. He is happily married with three sons and enjoys coaching, traveling and community service.